When Anissa Helou told me she was writing a book on the foods of the Islamic world, I was surprised, and a little curious. I didn’t know much about the food, but I am always drawn to the flavors, and ingredients used: Lots of vegetables, olive oil, pulses, grains, olives, spices, handmade cheeses and flatbreads, fresh fish, and grilled meats. In short, the kind of food I could live on, and sometimes, I do. A few years ago, Anissa invited us to dinner in her loft when she was living in London, and started with a spectacular, but simple, puree of eggplant and labneb with orange saffron juice resting in pools over the top. 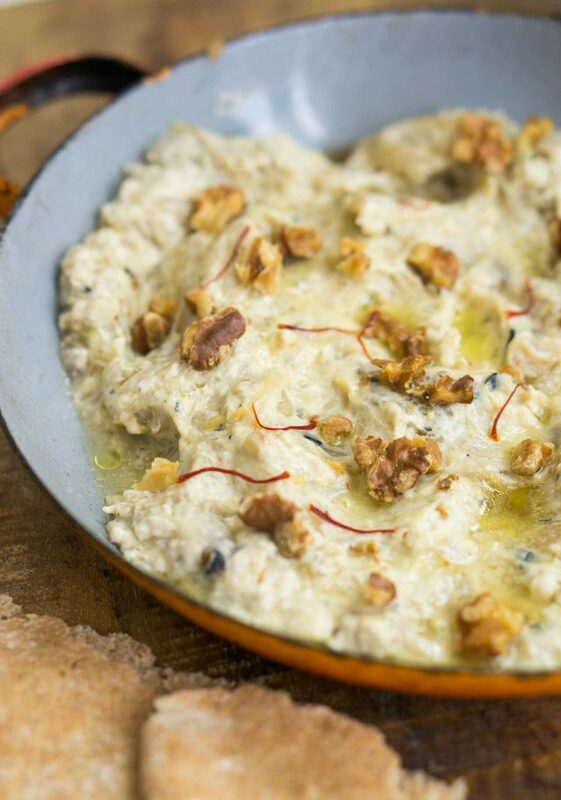 I was familiar with Eggplant Caviar, Moutabal, and Baba Ganoush, but the idea of mixing eggplant with tangy fresh cheese was a revelation. She gave me the recipe, which I’d planned to make since that evening, but it got buried in the bulging folder of recipes called “Recipes to Make” that’s part of a larger stack of folders in my kitchen, and office, that keeps growing and growing and growing. So I was thrilled to find that Anissa included the recipe in her book, Feast: Food of the Islamic World, which prodded me to give it a go. The book itself is huge; over 500 pages, with a subject, and scope, that merits the heft. The book starts out with an eighty-page chapter on breads, everything from saj to Syrian fatayer, ovals of dough filled with cheese, parsley, and spinach. There’s an Indonesian multilayered bread, called Martabak, filled with curried lamb and scallions, I’ve bookmarked because the idea of having a recipe for fried bread with a spiced lamb filling is too much to bear, and I need to make it. 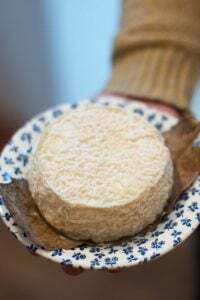 There’s a Baked Rice Cake with Lamb, from Iran, that features a very crusty exterior of crisp rice, enclosing a filling of tender, braised lamb. And I’m eyeing the Semolina Cake, called Basboussa in Egypt, which I think would be great with a juicy cherry compote or fresh summer fruits. 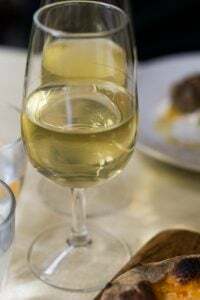 Even though some of the dishes are unfamiliar and may sound daunting, there are step-by-step photos of many of the preparations, to hold your (and my) hand, as we go. Eggplant isn’t the prettiest thing to photograph, but when sautéed with good olive oil, onions, and garlic, it turns into something silky, and tasty, and works magically as a base for (and with) other flavors. And regarding olive oil, people forget that olive oil isn’t just something that keeps foods from sticking to the pan. It’s a flavor. 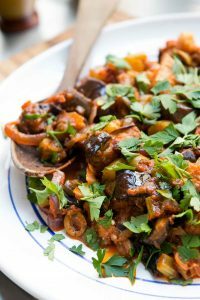 I thought the original recipe in the book had too much, but corrected myself after I stirred in the eggplant when I was cooking it, and found that it was necessary for moisture, and – yes – for flavor, when I tasted it later. 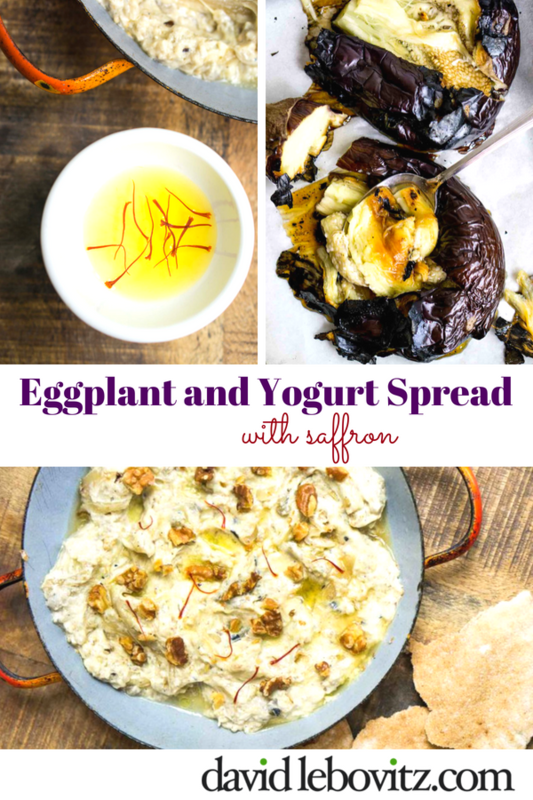 A word about that labneh: The recipe is called Eggplant and Yogurt Spread (Borani-e Bâdenjân) by Anissa, and yogurt is the base for labneh. I tried it with Greek yogurt and it didn’t have the right assertive tanginess and texture to stand up to the eggplant. You can buy labneh at most Middle Eastern markets, but it’s incredibly simple to make your own – you basically strain plain yogurt for a few hours, or overnight, and that’s it. Feast is one of the few books that, as soon as I arrived and I opened it, I sat down for a good thirty minutes just to read through it. It’s a wide-ranging book on a cuisine, and a culture, that are unfamiliar to many of us, and I’m looking forward to learning – and eating – more from it. Adapted from Feast: Food of the Islamic World by Anissa HelouA few notes on the recipe. 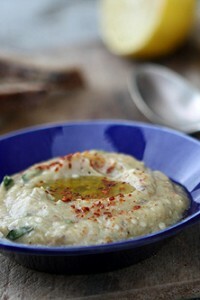 This uses labneh, made by straining yogurt, and has more acidity than Greek or Greek-style yogurt, at least to my taste. So I recommend you use labneh. (It's easy to make - recipe here.) 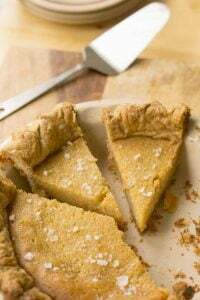 If you use Greek yogurt, you'll probably want to add a little lemon juice, to taste, when everything is mixed together.Saffron is a costly seasoning and well worth it. Be sure to buy from a trusted source, so you get what you pay for. If it's out of your budget, you could mix a little powdered turmeric with some hot water for the same effect, but note that it's not the same flavor (and not authentic), and stains anything it touches.Lastly, I was surprised at how much olive oil was recommended and tried cutting it back by half. As I cooked everything, I realized that it was correct amount needed to get everything to the right consistency, and flavor. 1. Preheat the oven to 350ºF (180ºC). Line a baking sheet with parchment paper. 2. Prick the eggplants a few times around them with a paring knife. Set the eggplants directly over a gas burner and roast, turning occasionally with tongs, until they are soft and wilted, 5 to 10 minutes. (The longer you leave them on the flame, the more "roasted" they will taste.) Place the eggplants on the prepared baking sheet and bake until they're soft all the way through, 20 to 30 minutes. 3. Remove the eggplants from the oven and when cool enough to handle, split them open and scoop out as much as the pulp as possible, and set it in a mesh strainer or colander. Let drain for 20 minutes, stirring it a few times while it drains. Once it's drained, mash the eggplant with a fork until it's a chunky puree. 4. Heat the olive oil in a skillet over medium heat. Add the onions and season with a bit of salt. Cook until wilted and translucent, stirring constantly, about 5 minutes, then add the garlic and cook for 1 minute more. 5. Add the eggplant and cook for another 5 minutes, stirring occasionally, seasoning with salt and pepper. Remove from heat and cool completely. Add the saffron to the water and let it steep. 6. 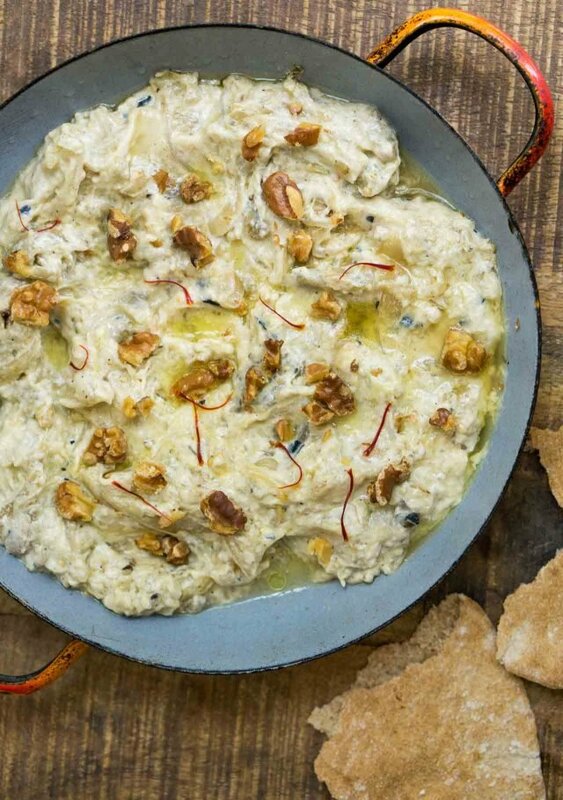 Stir in the labneh and scrape the spread into a wide serving bowl. Spoon the saffron threads and the liquid over the spread and sprinkle with chopped walnuts. Serving: Serve the spread with pita bread, or another flatbread, or crackers. 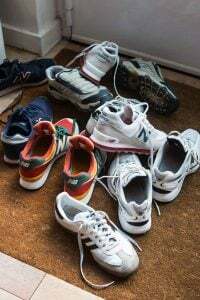 Storage: The spread will keep in the refrigerator for 4 to 5 days. I love eggplant. And labneh. This looks amazing. You do all of us such a favor by presenting such a wide variety of foods and cuisines. I always discover something new and interesting here. Indeed. David has taught me to cook. I want to make this so much, but I can already hear my fire alarm going off. I’m wondering if the roasting part could be accomplished on a charcoal or gas grill? Charcoal would be fabulous! That smoky flavor would be absolutely luscious. 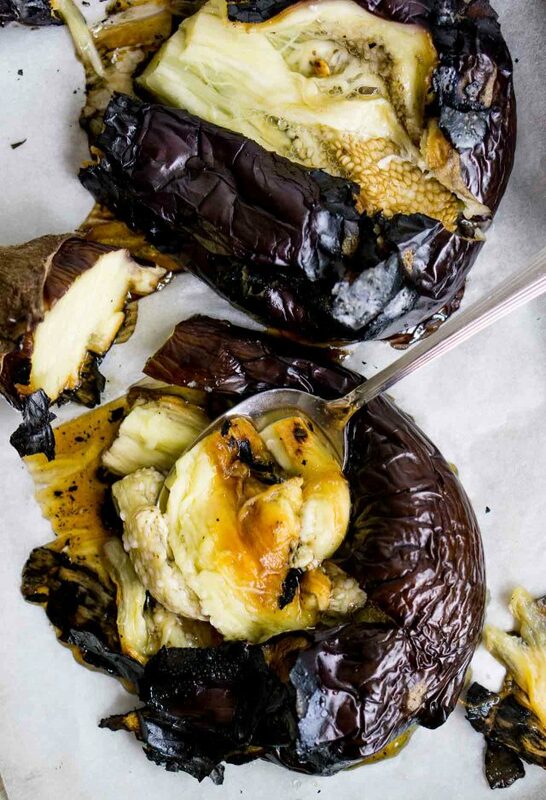 But firing up your charcoal just to roast eggplant might be counterproductive. Unless you’re going to be using them for steaks as well. Just saying. Yes. I have roasted eggplant on my gas BBQ outside. Works like a charm. I used gas right on the stove top to roast eggplant all the time. And my fire alarm does not go off. I have discovered SYRIA, RECIPES FROM HOME, by Itab Azzam and Dina Mousawi and am working my way through. The turmeric cake is specially wonderful, and I just tried to char an aubergine (eggplant to you, perhaps) but didn’t get it quite right. Will try again. Great fun. I’ve had my eye on that book as well. Glad you’re enjoying cooking your way through it! I treated myself to it earlier this summer. Best $$ ever spent. I agree. I also do it for roasted capsicums. A low gas flame and frequent turning will ensure beautifully blackened skin, perfectly roasted insides and that lovely smoky flavor that grilling doesn’t produce. And no fire alarm. This looks amazing! I don’t have a gas burner. Is there anything I can do with an electric stove? If your oven has a broiler, you can set the eggplants under the broiler to let them char around the outsides, turning and watching them carefully. The original instructions in the book say to do that for 30 to 40 minutes, but that might be a long time and I’d rely on how they look (charred on the outside, all the way around) rather than a specific amount of time. I find your blog, from recipes to copper pans, very inspiring David. Thanks for doing it! Thanks. 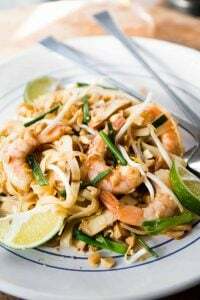 I think it’s fun to experience recipes from other cultures, because we often think they’re difficult, although most of them are meant for home cooks. David I recently bought your newest edition of The Perfect Scoop. I did not find a recipe for corn ice cream. I know Europeans look askance at corn generally but good corn ice cream is so yummy! However, that said, there are good recipes and not so good, but now you have a reason for a 3rd edition! I was considering adding one, but fresh corn on the cob isn’t widely available (or eaten) in France, and what’s available isn’t the same sweet corn that you get in the States. I did add a Caramel Corn Ice Cream, which is terrific, instead! 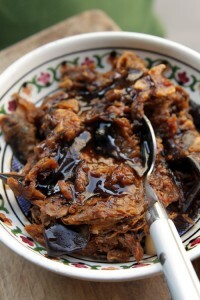 I roast eggplant in my electric oven frequently. Cut in half lengthwise, brush each cut side with olive oil, sprinkle generously with salt, and roast at 400 degrees until cut side is browned to your liking and flesh is soft and silky. I don’t usually char the eggplant, just go for a nice deep caramelization, but I suppose you could achieve a charred look/smokey taste if you roasted longer or at a higher temperature. where is the ‘orange’ flavor mentioned in your comments above the recipe? I think he is referring to the color, not the flavor. Basboussa is my favorite sweet from childhood! Made right, it tastes sweet but floral, and adding anything else might be gilding the lily. such wonderfully elegant cuisine! And those allergic to nuts what do they do? Do they exist? I don’t see any instructions on what to do with the “pinch of saffron”. Looks like I put it in some liquid? before pouring over the top? Thank you David! I presume the saffron is soaked in the warm water before adding to the “spread”. Is that correct? Thank you. Looks/sounds amazing. Echoing the above comments re saffron: i am assuming the saffron is steeped in water. What else can we use instead of water? Warm olive oil? Just as a point of clarification…. Iran was not an Islamic nation. It’s food is Persian, and it’s old religion Zoroastrian—- If you include this cuisine in a book, you should also include the food of Israel (and Palestine). I come from LA, which has the largest population of Iranians outside of Iran…. they have been and are very vocal about their heritage. Is it a kilo total of eggplant, with each eggplant weighing 500 grams? I have family visiting in October and know they will love this spread. Do you think I can use the Japanese style eggplant for this? The markets here in HI are loaded with them. Great recipe ! The variety of tastes that can be achieved in the Middle East with the same kind of basic ingredients is just awesome. Regarding saffron, I always recommend to soak it in cold water or cold milk for a few hours (overnight…) for a better results. 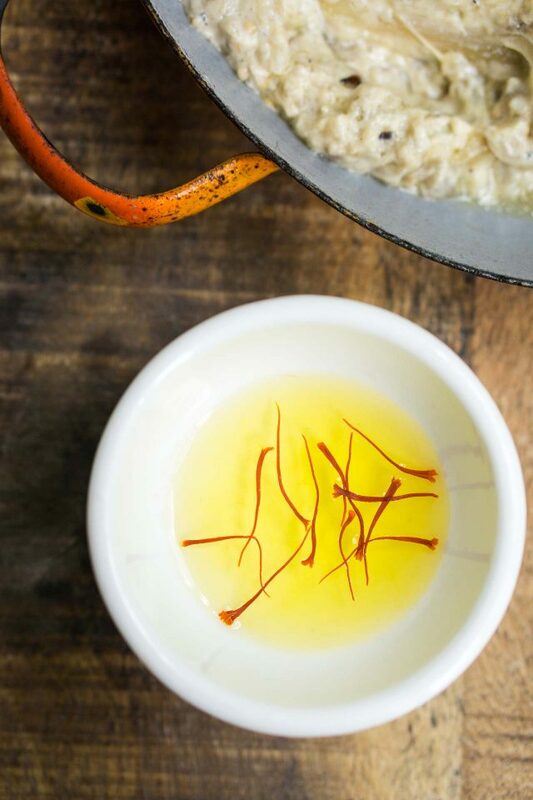 Saffron needs time to develop its taste and color, but heat quickly destroys the fragrance. Denise: Japanese eggplants have less moisture in them so if you want to give them a go, you might need to lessen the time in the skillet. If you give them a try, let us know how they turn out. Marie-Aude: You’re right. I usually use tepid water, so I edited the recipe. B, Peter, and Lynn: Yes, it’s added to the water then spooned over the spread. Cyndy: It’s the total amount of eggplant, for both of them. Earlier this year my mother holidayed in Iran and (bien sur!) brought me home some saffron. Keen to make the most of it, I read up on how best to use it. 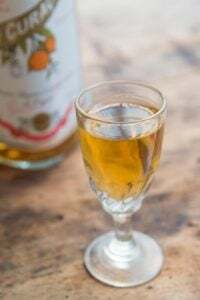 There were several recommendations to soak it overnight as Marie-Aude suggests – one person said you know when the flavour is fully extracted as the saffron will have lost its colour. I soaked mine overnight but the saffron still had plenty of colour in it. There were also suggestions to toast the saffron first and crumble the threads in the water. I’m still not sure what the best method is and continue to experiment. 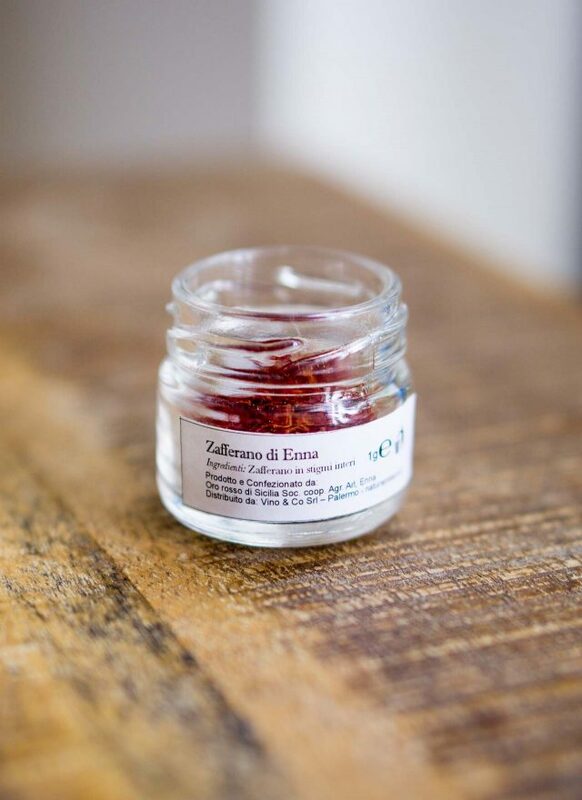 You can find excellent saffron in Le Perche, where small manufacturers are coming up with wonderful products like saffron honey, as well as selling saffron itself. It’s all centered around Nogent-le-Rotrou. Look for Bruno Salgmulder, the actor turned saffron grower. let me know if you need more help in find it. I love eggplant, but I don’t like the seeds. Do you try to remove them? If not, do they alter the taste of the spread? You could try it with Japanese eggplant (the long, narrow, light-ish purple ones you can get from most Asian grocers) or a small Sicilian eggplant (round, light purple, about the size of a softball). They tend to have far fewer, smaller, and less obtrusive seeds. I hate eggplant seeds too–they had me convinced up into my 20s that I hated eggplant–and rarely buy any kind of eggplant other then these two kinds. The book sounds great, and I hope it inspires you to start planning a trip to India, where the Islamic and Hindu culinary traditions are just two of the many that are alive and well in that fabulous sub-continent. 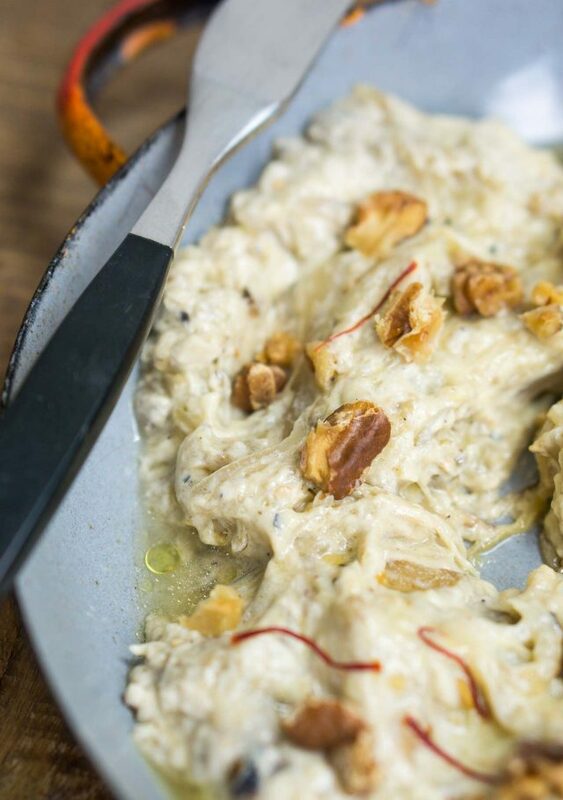 For an appetiser, check out Christine Manfield’s book TASTING INDIA and take it from there…. David! You walked right past me on the street in NYC last week but you were talking on your phone. I would have loved to have said hello and to thank you for your wonderful books and blog! 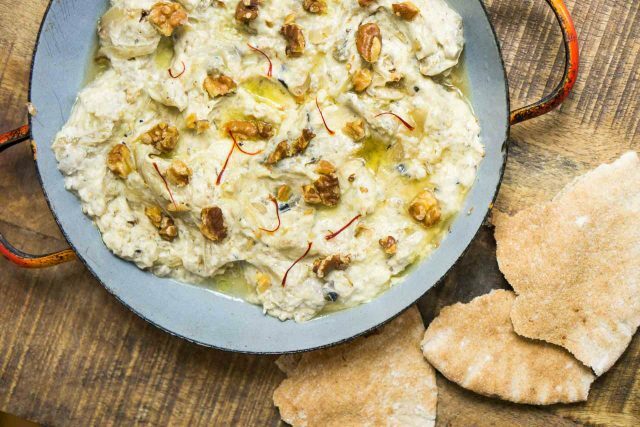 I made this tonight (using the Greek yogurt/lemon juice hack) as an appetizer along with homemade pita bread and (decidedly un-Islamic) sangria. It was amazing! It runs rings around Baba Ganouj (which frankly I’ve always thought of as rather “meh”). I was reading this in the Louvre and wanted to run out and find a Lebanese restaurant, drooling like crazy..There’s a delicious saffron Greek yogurt ice cream (+ orange zest) in The New Persian Kitchen you might like as well. I wonder why with such a sweet tooth I so crave savory, lemony foods? Maybe a balance thing. I could live on them everyday too. My Feast book arrived this week and I can’t wait to try this recipe and many others, like the flatbread with scallions that rolls up like a coil, then flattened, very cool…. what a beautiful cookbook. Yes, the flatbreads in the book are particularly inviting! Made this yesterday afternoon to go with our dinner. Absolutely gorgeous. Thanks for sharing! Made this yesterday and what a terrific recipe. Only 2 of us so used 1 eggplant and it was plenty with some leftovers. 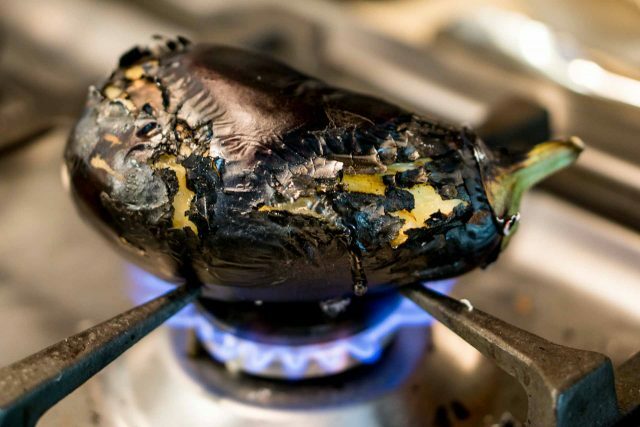 Take time to really char the eggplant before putting in the oven. Love the flavors! I concur – I made the dip this week and it was fabulous! It is going to be a staple around here. Thanks for pointing us to Anissa Helou’s book and for your blog in general. I learn a lot! p.s. The buttermilk salad dressing was also truly delicious. What about pistachios instead of the walnuts. More Iranian, no? I’m not an expert on Iranian food, but Anissa did extensive traveling and research, so it may be traditional to use walnuts here. (Iran is a large exporter of walnuts, and I know they are frequently used in their cuisine.) But one could certainly use pistachios instead! A colleague had given me an eggplant a few days before you posted this. Ran out and bought some saffron the day after you posted. Thanks for this recipe! 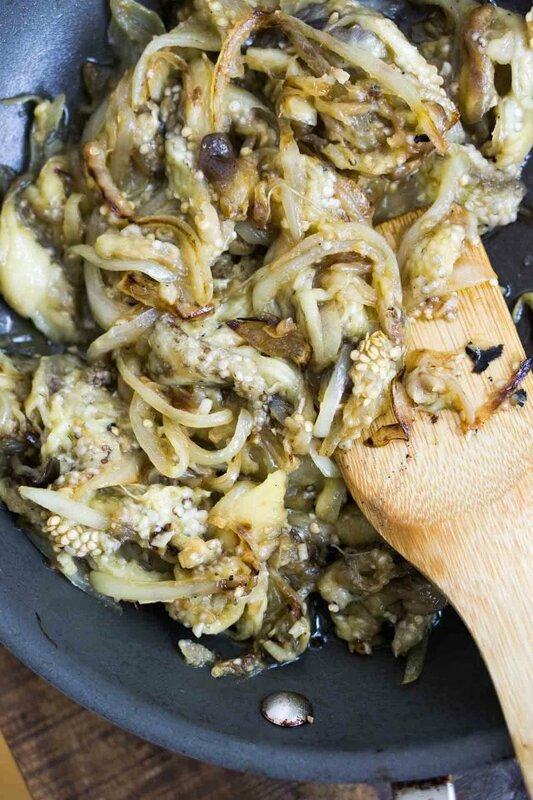 It’s much lighter than babaganoush, a nice alternative. Also makes me think about possibilities for labneh. 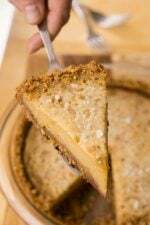 Thank you for the introduction to the cookbook via this fabulous recipe. I made it exactly as given and loved it. (the finished dish looked just like your photo which pleased me enormously). And it was a first time using labneh so that was fun. I made this yesterday (including the labneh as you recommended). I followed your recipe precisely. It is positively delicious. Thank you, I will be making this again. Great dish, as is. Made it for a large lunch yesterday, and it was devoured by everybody. Will certainly make it again. The best way to tell if spices or seasonings are fresh is to smell them. Most should be stored in a cool dark place (heat and light are the worst enemies of most spices) so it depends on how, and how long, your saffron was stored. I would smell it and use it based on that. You could also put a pinch in some cold water and see if the flavor “blossoms,” too.